Embedding 3rd-party analytics technology continues to grow in popularity with software providers, while using clunky stand-alone tools are in decline. Evaluating embedded analytics products means looking at different factors from those you may have considered when buying stand-alone BI products. 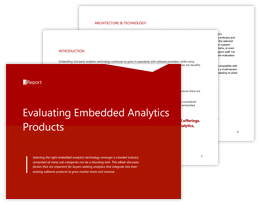 This eBook presents the key points to consider when choosing an embedded analytics product and serves as a guide to evaluating products on the market.